“On June 7, 1989, I made the front page of every Chinese newspaper worldwide,” says Mick Flanders, with deliberate poise. 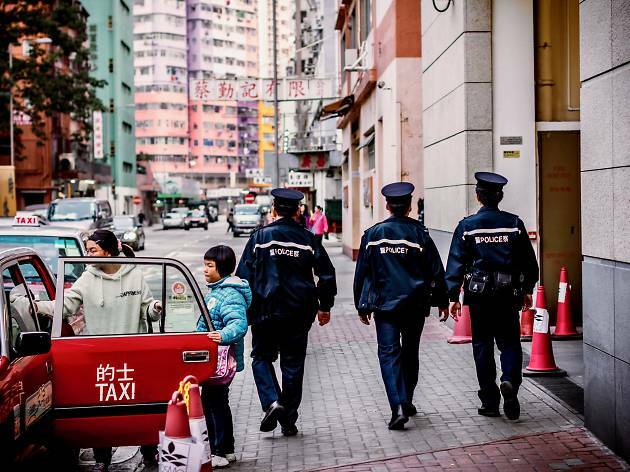 Flanders – not his real name – joined the Hong Kong Police Force in 1983 and is due to retire in the next four months. His 31 years of service have taken him through plenty of groundbreaking moments in the city’s formation, from 1984’s Sino-British declaration and the handover in 1997 to the recent Occupy protests, which have presented the force with one of its biggest challenges to date. Flanders’ brief but widespread encounter with the media during the Tiananmen fallout in Hong Kong highlights the huge impact on the public that our police make when it comes to dealing with the sporadic-yet-critical protests and political events that have shaped the city over the past two centuries. Nowadays, of course, officers are documented by thousands of smartphone cameras and every wrong move is a potential PR pitfall. But this wasn’t always the case. The force in Hong Kong has a long history. In fact, 2014 marks its 170th anniversary, making it one of the city’s oldest institutions. It was 1841 when Commodore Sir Gordon Bremer rst raised the Union Jack at Possession Point. The First Opium War between Britain and China was ongoing and crime was spiralling out of control. Gambling dens, brothels and opium dealers were springing up in Hong Kong as quickly as the population who used them expanded. The watchmen who walked the streets at night, banging gongs to keep away bad spirits and miscreants, just weren’t enough. 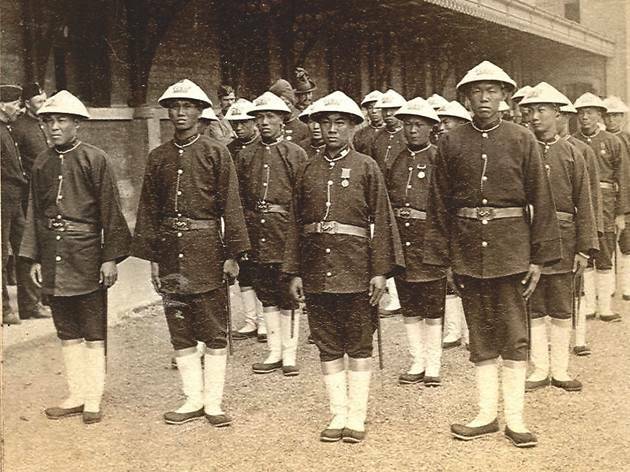 In response to the messy situation, The Colonial Police Force was of cially born on May 1, 1844. Back then, there were only 32 of cers serving a population of around 20,000 people. They had a pretty rough start but, in only a few short decades, the force, led rst by Charles May and into the 20th century by Francis Henry May, had signi cantly curbed crime in the booming city, as well as helping to eradicate the deadly plague that struck in the 1890s. After many of the serving of officers were killed during the Second World War, the force had to experience a rebirth. With numbers diminished, facilities destroyed and Triads running the streets after the Japanese occupation, it was a tall order for Commissioner Duncan MacIntosh, who was appointed in 1946. In the following few years, a million refugees poured over the border from Shenzhen, eeing the Chinese Civil War. Riots broke out amid political clashes between the new arrivals, and looters and Triads revelled in the violence. As a direct result, the Police Tactical Unit was formed in 1958. The political unrest was a precursor of what was to come only a decade later. 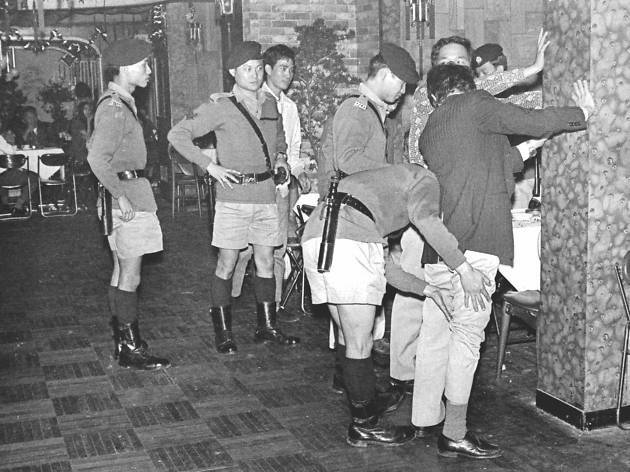 In 1966, a seemingly innocuous five cent rise on the Star Ferry fee set off four nights of rioting in Kowloon. In the following spring, thousands of pro-Communists marched on Government House, waving copies of Mao’s Little Red Book in the air. Many months of severe unrest followed. Crowds were broken up with tear gas, homemade bombs were found almost daily and there were multiple deaths on all sides, including a young girl and her brother who were killed by a bomb while playing in North Point. John Moray-Sykes – not his real name either – joined the Colonial Police Service in 1962. He was posted to the frontier division in Sha Tau Kok between 1966 and 1968. There were many con icts on the border in this period amid genuine concern that China would invade Hong Kong. Moray-Sykes recalls one big skirmish with Communists over the border in the summer of 1967 – one of several that year. “I’m guessing it was around 10am, he says. “Everything was quiet besides the screaming of obscenities. But [the Communists] suddenly opened up with a machine gun and it sprayed our police post. The police officer behind our gun got a bullet right through his head and a Pakistani officer was also fatally wounded. Five officers were killed that day. They were my men, you know. 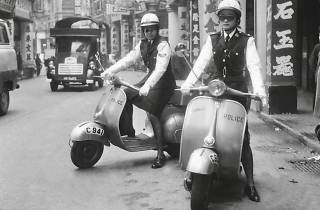 One of them was the police hockey team goalkeeper.” In 1969, the Queen conferred the title of Royal Hong Kong Police upon the force as a reward for their handling of the 1967 riots – a title they kept until 1997. Corruption had in fact been rampant in every echelon of society for a long time – ‘tea money’ was required to get anything done, even to call out the fire brigade. When Chief Police Superintendent Peter Godber, a hero of the 1967 riots, came under investigation in 1974 for corruption, he quietly vanished from the city. This led to mass protests and, ultimately, the inception of the Independent Commission Against Corruption. It wasn’t long before matters started to improve. 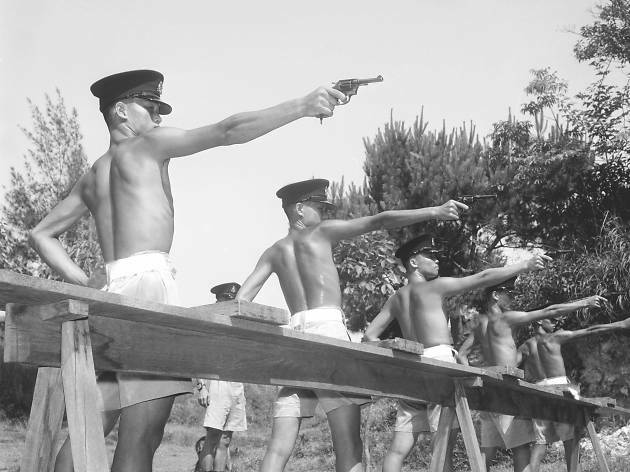 The handover also led to new tactical and training measures, which in turn resulted in a two-tier force – those serving under the pre-97 regime and those disciplined in the new service-industry model. The hierarchy of the recruitment process became dominated with theory-based sections, such as leadership training and a psychometric test, which, enforced in 2010, assessed personality traits. 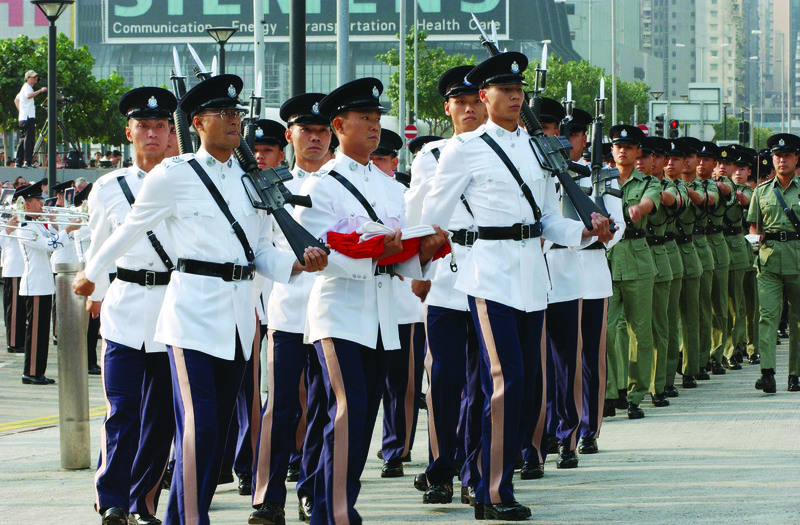 A former auxiliary constable, Rocky Wong, joined in 2008 and resigned in 2010. He, along with other classmates at the time, signed up when force members came to his university to recruit young blood after a rise in veteran retirements. “We had three months of intensive training and then we could take shifts regularly, so I’d do weekends,” he says. “Physical training wasn’t a huge part of it – it was mainly laws and regulations. I joined because I’ve always wanted to help people. But I have to admit, a lot of my friends just joined because of the good pay.” Many of his friends went on to become officials in the force. Currently a constable is paid between $19,545 and $31,265 a month. A senior inspector can earn up to $69,245. Sitting ducks then, and targets for public ‘abuse’. 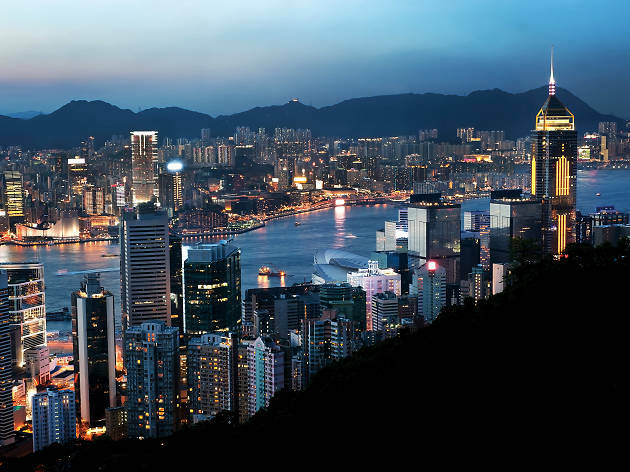 But despite this – and whispers of Mainland political governing – relatively few challenges since 1997 have meant the city has remained pretty much unrocked. 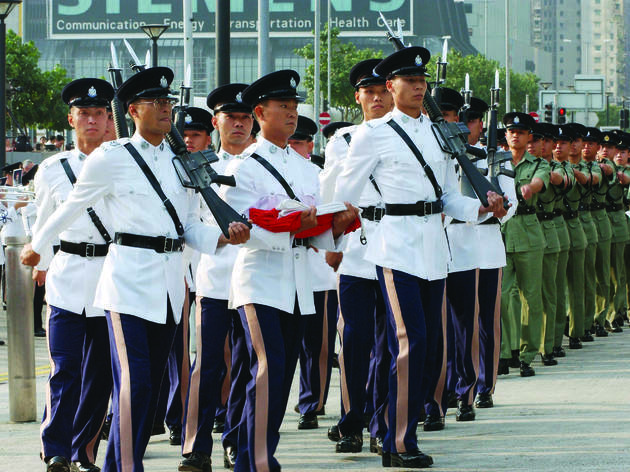 The force, it’s been assumed, has had a good handle on its two-tier system, as well as its transparent ties to the PRC. Post-97, its public image has been a relatively good one. It seems that along with exposing ugly sentiments in class divisions and capital imbalance, Occupy has also snapped a thread between the public and the force that has long been unravelling since 1997. 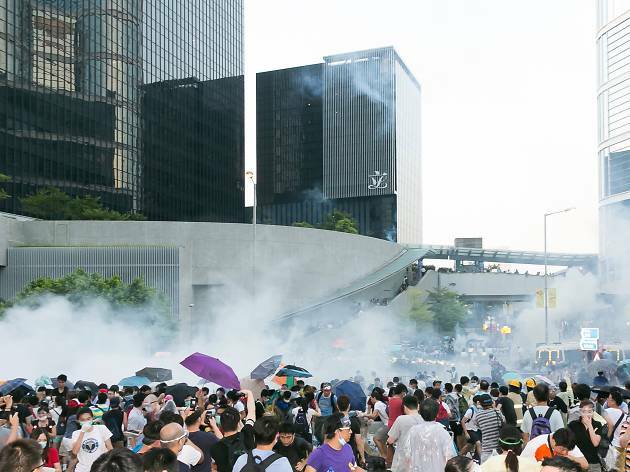 The once ‘apolitical’ police are now viewed as a bargaining chip – masked enemies to the protesters, heroes with the power to enforce the law by anti-Occupy parties, and a cover shield by the government and CY Leung, who stated in an interview with TVB that eld commanders ordered the tear gas on September 28, but he was involved in the decision to curb its use. Within the force, however, one opinion is clear: Occupy Central is the biggest challenge, physically and psychologically, that the current generation of officers have ever faced. As we go to print, 324 individuals have been arrested in the past month, casualties are in the hundreds – including police officers – and more than a thousand complaints have been received about the force’s handling of Occupy, the highest numbers relating to ‘unnecessary use of authority’. On one hand, the police are struggling to allow themselves to be seen as both military-trained professionals and, at the same time, as negotiators of peace. A schizophrenic flip from bad-cop to good-cop. Additional reporting by Judd Boaz, Lisa Cam, Layla Ho and Jessica Li. Upon request, all names of those interviewed have been changed. Want reasons to love Hong Kong?